Google has announced Pixel 2 XL smartphone. It has a 6-inch Quad HD+ P-OLED Fullscreen 18:9 display powered by an Octa-Core Snapdragon 835 Processor. It comes with 4GB DDR4X RAM, 64GB / 128GB storage, expandable memory up to 256GB with microSD. It runs on Android 8.0 Oreo. On Camera it has a 12.2-megapixel rear camera with LED flash, Optical Image Stabilization (OIS), Dual Pixel and an 8-megapixel front-facing camera. 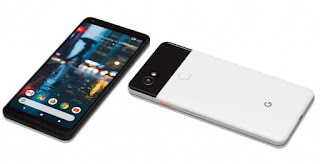 Google Pixel 2 XL has a fingerprint sensor on the back and comes with Aluminum unibody with hybrid coating and has Active Edge for quick squeeze to launch Google Assistant.Packed with a 3520mAh Battery.